All this time I thought evolution WAS science. Silly me. He’s not really a ginger, he just loves tomato soup. He’ll have even more fun beheading that three-headed guy later. His name is Red Will Donahoe BTW. Without science, we would all be reduced to holding up our pants with rope! Who was in charge of handing out the weapons? Giving a melee weapon to someone lacking binocular vision is probably not the best call. It appears evolution hasn’t been kind to his one-eyed, three-headed cohort. Maybe Redbeard should switch over to the science side of the battle. ‘Never before published’. And only pdfs afterward, apparently. @FB As long as he stays with overhead strikes, things should be okay. He looks like he’s giving a speech about how the man he just decapitated was a “Traitor to the Earth” or some such, to his crew of escapees from the Planet of the Apes franchise. Redbeard himself, meanwhile, looks to have come straight out of a Viking movie. Ravaged by science. Ravaged, I tell you! “Ruined” is far to mild a word for what Science has done. You think Redbeard is bad? Be glad he got to you before Science did! Was the publisher so ashamed of the art that when they did release it, they decided the art had to be shrunk down to less than half the cover? They thought a lot of white space and text — plus a giant title — was what the nerds wanted in 1969? They were embarrassed to have a Kelly Freas cover? @THX: I thought so too. Not as bad as ISTBE, but with absolutely no pajamas. All right, friends. Today’s new word is “aberration”. Say it with me now, “Ab-er-ra-tion”. 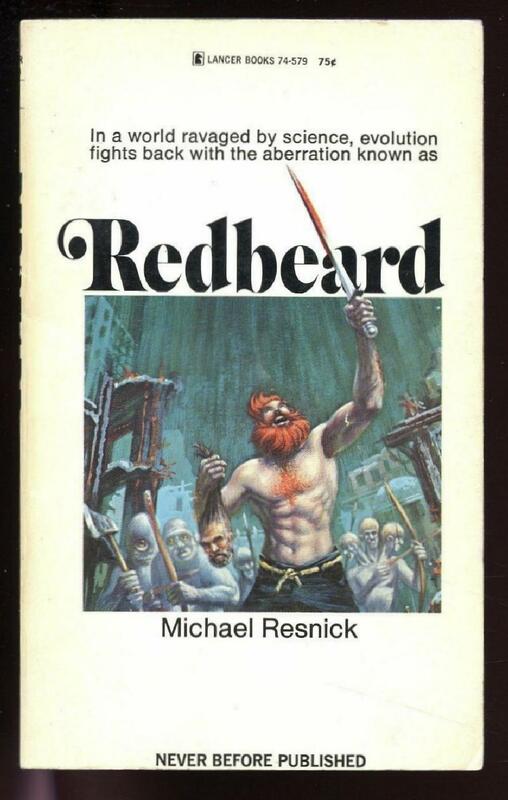 In a world filled with three-headed people, neckless Cyclopes and the like, the bearded ginger is the aberration? Judging from the cover, an aberration is a strange-looking stomach.